Christmas cheer is in the air thanks to Stamford’s College Hunks Hauling Junk & Moving. Just as the name suggests, the company hauls and moves people’s stuff. But some recent acts of kindness will help you remember them in a “giving way”. In November, College Hunks along with 111 Harbor Point Complex held a massive coat drive to donate to coats and jackets to people throughout Connecticut and New York. Shortly after the coat drive, College Hunks partnered with 2 fire houses by donating 100 ducks to give out to kids when they went to the fire houses to bring some holiday happiness to boys and girls. 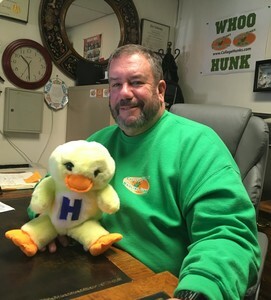 Franchise manager Thomas Yewdell and his College Hunks team brought 900 plush yellow ducky puppets to Toys for Tots on Canal Street. Yewdell owns two College Hunks Hauling Junk & Moving franchises, one in Stamford, CT and one in Mamaroneck, NY. He will also soon be opening a second-hand store called First Shot, where people will have their first shot at buying antiques and second-hand treasures. He hopes to continue using his resources to donate to his community. College Hunks Moving and Junk Hauling is locally owned and operated, helping homeowners and businesses move, haul junk, spring cleaning, and local residential moves. Call for your estimate 203-817-0400. It’s a great time of year to donate old furniture and knick-knacks for year-end tax donations.